Reconnecting Mahler's music to the landscapes that nourished his life and art. The second of two essays. MAIERNIGG, Austria — Over the course of his all-too-brief artistic life, Gustav Mahler wrote most of his nine symphonies during summertime retreats in the Alps. Since this activity required quiet and solitude, he built secluded one-room studios — composing huts — at three different locations. Remarkably, all three of these fairy tale-like structures have survived. To visit them in short succession, as I did last summer, is to retrace the stations of Mahler’s creative journey. Perhaps it could also, I’d hoped, restore to this “universalized” music the potency of a particular life history, and the power of a linkage to a specific place. I had begun in Steinbach, the site of Mahler’s first hut, which I wrote about last fall. Now I’d arrived in Maiernigg, on the Wörthersee, where Mahler spent summers from 1900 to 1907, and where he had a villa constructed by the water, with a studio built in the woods above it. It was here that he completed the Fourth Symphony and composed the Fifth, Sixth, and Seventh. 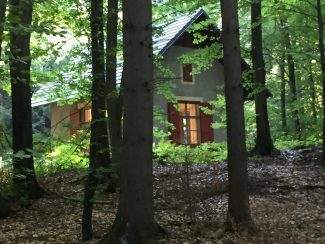 Mahler’s second composing hut, located in Maiernigg, in the hills above the Wörthersee. One reads that Mahler loved hiking in these picturesque mountains — “He walked,” we are told, “with a firm almost pounding step” — but it is rather a different experience to feel this fact in one’s own lungs. To reach the Maiernigg hut, you must walk up a somewhat steep path from the road below. Hazarding my best attempt at Mahlerian vigor, I couldn’t help but feel sympathy for the house cook, who used to carry the composer’s breakfast to his studio on a heavy tray every morning. The hut turns out to be a surprisingly large, solid structure, as if Mahler’s workspaces had been tracking his career ascent. By this point he was the director of the Vienna State Opera; as a composer, if still little known, he was in firm possession of his powers. With its thick stone walls, the studio seems less like a hut than like an artist’s private fortress. When I arrived it appeared to be deserted, and the door was open. I walked right in. “Grüss Gott!” chirped a woman at a desk, jolting me out of whatever spell the walk had cast. I’d been expecting a solitary visit as in Steinbach; here instead was a guide ready to answer any questions. Stranger still, she motioned toward a stereo and a collection of CDs, asking cheerfully which Mahler symphony I would prefer to listen to during my visit? It felt a bit like arriving at the North Pole and being asked if I had a documentary of choice about the snow. In truth, I preferred silence. Yet this is the odd part about any exercise in cultural pilgrimage, any visit where one hopes to experience something more than a dry exposition of the past: The endeavor always seems capable of tipping over into a naïve or kitschy literalism. (Would I next be offered the chance to partake of Mahler’s favorite lunch, or slip into a replica pair of his work slippers?) At the same time, such locations do not offer up their secrets before a glib or ironic gaze. It would be all too easy to view them through a cloud of skepticism or solipsism so thick that we encounter nothing but the echoes of our own projections onto the past. A half-hour passed quickly as I took in the space and a related exhibition. Mahler spent some of the most joyful days of his life within these walls. He had a stove in the corner, where he brewed his coffee. There was the imposing iron cabinet where he locked his manuscripts at night. This was also where, having walked up to the hut “arm in arm” with Alma, his wife, he played her his newly composed Sixth Symphony. But other things, too, had transpired here. On the wall, inevitably, I spotted the image I’d been waiting to see: a photo of Maria, the older of Mahler’s two children, who at age 4 had died of scarlet fever here in 1907. This fact appears in countless program notes. Yet here, when one meets her gaze staring from these particular walls, it’s charged with a different valence, a piercing intensity. Indeed, visits like this can leave another kind of mark — expanding what we hear when we hear the music. “At a single blow,” Mahler wrote to Bruno Walter, “I have lost all the clarity and calm that I had ever struggled to achieve.” After the summer of 1907, broken by loss, Mahler never returned. The next day’s drive to Toblach (in Italian, Dobbiaco) in South Tyrol, where Mahler built his final hut, took less than four hours. The town sits close to the Italian border, nestled in a valley with spectacular views of the Dolomites. This, one realizes instantly, is the native habitat of “Das Lied von der Erde” (“The Song of the Earth”) and the towering Ninth Symphony, which will be heard in performances by the Boston Symphony Orchestra this week. These late works breathe a very different air. The Mahler of his final Toblach summers (1908-1910) had lost not only Maria, but also his post at the Vienna State Opera and, crucially, having been diagnosed with a heart condition, faith in his own health. It was also here that Mahler was dealt the grave blow of Alma’s betrayal with the architect Walter Gropius. The hut seems of a piece with this season in Mahler’s life. 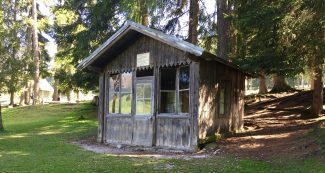 If Steinbach was bright and open, and Maiernigg a wooded fortress, the Toblach hut is a “late” hut: provisional, hollowed, weather-beaten and seemingly erected without any illusion of permanence. It’s built not of stone, but of wood, and one easily imagines the cold piercing its walls, as Mahler describes in many letters, or the wind rattling its windows. Yet the composer could, from this protected space, look out lingeringly onto a valley of glowing radiance. The hut, in other words, reminds one of the Ninth Symphony. It is also in a rather alarming state of disrepair, with cobwebs, missing window glass, faded displays, and sections of wood that seem to be rotting. It sits on privately owned land near the inn where Mahler rented rooms during these summers. Rather bizarrely, the current owners have turned the property into a kind of animal park. Italian families bring their children here to see pigs, goats, and the like. I watched several groups of park visitors stumble upon the hut en route to the animals. One man squinted up at a small plaque above the door, and then walked on. Still, the hut’s charisma is unmistakable, flowing not just from its combination of beauty and decay, but also from its position as a final promontory in Mahler’s life, a terminus from which he arrived at some of his most durably modern insights. This is not always how we think of Mahler. The fact that he died before the First World War sometimes seems to inoculate his image from what became of the 20th century. It jars, for instance, to remember that sitting in the Vienna audience for Mahler’s performance of “Tristan und Isolde” on May 8, 1906, was a 17-year-old Adolf Hitler. We prefer not to think of the anti-Semitic Viennese press that hounded Mahler out of the city as the same that welcomed the 1938 Anschluss like a homecoming. This article appeared in the Boston Globe on April 7, 2016 under the headline “Glimpsing Mahler’s Music in its native habitat.” It was the second of two essays on the composing huts of Gustav Mahler. The first essay may be found here.